My friend from Tarrytown came into the city on Friday and we had a birthday/holiday celebration of sorts. We started out the night with a little Midtown East bar hopping. We began with a drink at the Oyster Bar Saloon, then headed over to the Waldorf’s Bull and Bear and finally ended with a nice Belgian beer from BXL. All of this beer drinking was just in preparation for the main event-dinner. My friend had a birthday gift certificate from Patina to use so we decided to try out Brasserie. Walking into Brasserie I was a little taken back by the décor. It was a bit over the top and I kind of felt more like I was on a space ship than a fancy French restaurant. Luckily I had requested a booth when making the reservation so I felt much more in my comfort zone than if I had been at a table in the main area. Neither of us was feeling like a huge meal so we decided to forgo appetizers and just stick with entrees. 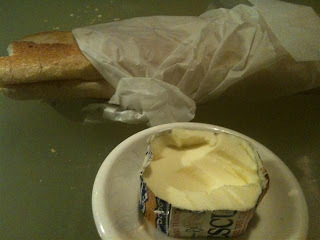 We ordered a nice bottle of Pinot Gris and munched on the bread and butter until our entrees arrived. For my dinner I ordered the Grilled Branzino. 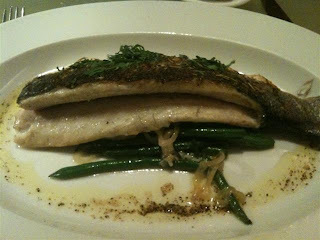 I absolutely love Branzino and this dish was about as close to perfection as you can get. The fish was unbelievably moist and seasoned with a wonderful mix of herbs and butter. The haricot verts were incredibly tasty as well. They were cooked with some caramelized onions that really brought out the flavor of the bean and brought it to a whole new level. My friend’s entrée was fanstastic as well. 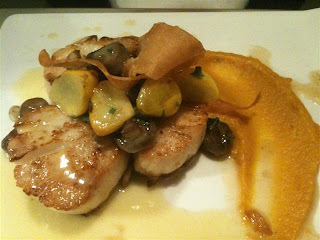 She ordered the Sea Scallops with Morels, Cippolini Onions and a Butternut Squash sauce. As with the fish, the Scallops were cooked perfect with a nice brown crust on the outside. I was a little bit worried about the combo of scallops and squash sauce but it turned out amazing well. The sauce and mushrooms gave the whole dish a very earthy feel that I have never experienced in a seafood entrée before. We both pretty much licked the plates clean and were too stuffed to even think about dessert. Our bill came to $102 and with the addition of the $50 Patina birthday card it was only $51.00. That’s a great deal. We finished out our holiday/birthday night with a drink at Rolf’s where the amount of drunk men in Santa suits and bad Christmas sweaters almost made me sick. Overall I enjoyed my meal at Brasserie much more than I had expected too. The service was a little slow and the room was a bit gaudy but the food was amazing. I will definitely come back here next year when I can use my Patina birthday card.